The rank system of the Star Trek universe resembles that of the United States Navy in contrast to other science fiction franchises that use an army ranking system. In Star Trek: The Original Series (TOS) and Star Trek: The Motion Picture, ranks are indicated by sleeve stripes; in later movies based on The Original Series, ranks are indicated by pins on a shoulder strap and the left sleeve. In later television series, ranks are indicated by varying numbers of pips or bars on the individuals' uniform collars. The original uniform designs were the product of designer William Ware Theiss. The original series uniforms consisted of a colored top and dark pants, with significant variations between the designs used in the pilot episodes and the rest of the series. The first uniforms, as seen in the unaired pilot "The Cage" (footage was re-used in a later episode, "The Menagerie") and again in the second pilot "Where No Man Has Gone Before", are somewhat different from the Starfleet uniform seen in the rest of the original series. The original concept used a heavy, ribbed turtle neck collar of the same color as the tunic for the men, with a cowl neck variation for the women, each in three colors: gold, beige ("sand"), and light blue. Officers in the first Star Trek pilot, "The Cage," wore a single gold sleeve stripe, and only the officer grades of "lieutenant" and "captain" were used in dialog. A "chief" was also visible, but wearing a different sleeve stripe. Characters addressed as "crewman" wore no sleeve insignia. In the first pilot, the uniforms also included gray coats with silver rank stripes on the sleeves, worn on away missions and identical for men and women, and an optional gray cap. In the second pilot episode, "Where No Man Has Gone Before," most officers again wore a single stripe; Captain James T. Kirk wore two stripes. These differences between the rank indicators used in the pilots and those used in the main series could be explained by the fact that creator Gene Roddenberry and wardrobe designer William Ware Theiss had not yet worked out a consistent system for officer-grade indicator markings on the uniforms. This they would work out after the second pilot, "Where No Man Has Gone Before," succeeded in selling the series. I was wearing them on the street. What's wrong with wearing them on the air? I wore 'em on airplanes. It was the era of the miniskirt. Everybody wore miniskirts. 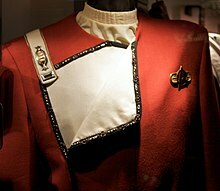 On certain occasions, the characters would wear dress uniforms (TOS: first shown in "The Menagerie" and later used in "Court Martial," "Space Seed," "Journey to Babel," and "The Savage Curtain") that are made of a shinier fabric, presumably a polyester satin, and are decorated with gold piping and colored badges that vary depending on rank. Montgomery Scott's dress uniform, especially as seen in "The Savage Curtain," includes a Scottish tartan. Specifically, it is the tartan of the Clan Scott, one of Scotland's oldest clans. Jumpsuits in the same colors with black undershirts were also worn, mostly by background characters. Beginning with the first regular series episode "The Man Trap", the department colors were slightly altered from the pilot versions: command and helm personnel wear gold shirts; operations, engineering and security personnel wear red; and science and medical personnel wear blue, all with black collars and undershirts. [notes 1] The most commonly used Command Section shirts were actually olive-green in color, but they appeared to be a golden-yellow color called "tenne" both under the lights used on the set and in the post-development film stock. In later series, the gold color was canonized in dialog. However, some uniforms – the alternate shirts worn by Captain Kirk, and the Command Section dress uniforms – were made of a different material which, while the same color, showed up as olive-green even under the lights and when photographed. [notes 2] The green shirts (seen in TOS: "The Trouble with Tribbles", "Charlie X" and "The Immunity Syndrome") may have the rank stripes on the sleeves or on the collar (TOS: "The Enemy Within"), and always feature the Enterprise assignment patch near the waist as a belt fastener. The frequent death of red-uniformed security officers led to the coining of the popular term "redshirt". Based on the success and increasing popularity of Star Trek in syndication, an animated version of the series was produced from 1973 to 1974. The uniforms depicted in this series matched the general parameters and appearance of those used in the live action series. The perception by fans of the command uniforms being yellow/gold instead of green, thanks to set lighting and other factors, resulted in the producers committing to a definitive gold-color for animation purposes. The command dress uniforms remained green to match the perceived colors represented by the live action series. However, the uniform pants were colored gray to match the actual fabric used in the live action series as opposed to the black they had appeared to be when filmed. The original plans for the aborted Star Trek: Phase II television series involved retaining TOS uniforms but when the project became Star Trek: The Motion Picture, they were replaced by a new design. Robert Fletcher continued this system when he designed the uniforms for Star Trek: The Motion Picture. The film has multiple uniform styles, including one-piece jumpsuits, matching shirt and pants, and tunics either with buttons or a sash around the waist. All uniform variants include shoes ("foot coverings") built into the legs of the trousers. Some uniforms have short sleeves, while others are long-sleeved, with either standing, v-neck, or turnover collars. Uniforms come in gray, white, gray and white, blue, brown, and beige. On the Enterprise, the arrowhead still remains the symbol for all staff members, but the elongated star replaces the science department's circle and oval crossover and the ops department's 6-sided spiral. With the uniform colors no longer representing departmental affiliation("Section assignment"), division is indicated by a colored circle set behind the arrowhead: red is for engineering, pale green for medical, orange for science, white for command, pale gold for operations and gray for security. Most of the uniforms in the first movie also included a noticeable "perscan" (short for personal scanner) medical monitoring device, mentioned in the Gene Roddenberry novelization of The Motion Picture, which appears on the uniforms in the position where one would expect to see a belt buckle. Rank is indicated by braids on long sleeves or on shoulder boards, identical to TOS. However, in a departure from the TV series, a new ensign rank is indicated, as a dotted braid around the sleeves and on the shoulder boards, as opposed to TOS, where there were no ensign rank indicators of any kind. Non-commissioned officers wear a hollow gold square on the shoulder boards but not at the sleeves, as, again, the show had no rank indicators for NCO's. New rank insignia for admirals are shown, in the shape of three solid braids side-by-side, followed by another solid braid, on its own, with an 8-pointed star on the shoulder boards. There are fewer stripes than on U.S. Navy uniforms, because four stripes for a captain would have looked "too militaristic,"  reflecting Roddenberry's insistence (often disputed[by whom?]) that the role of Starfleet was expressly not supposed to be military. Security guards wear white uniforms with brown helmets and breastplates. Engineers wear thick white spacesuits with large, black, ribbed collars. In The Making of Star Trek: The Motion Picture, Susan Sackett and Gene Roddenberry wrote that the uniforms were redesigned because the bright colors of the 1960s original, so vibrant on television, would distract viewer attention on the big screen. But the designs proved unpopular with their wearers, and when he took over as producer of the motion pictures, Harve Bennett ordered the uniforms redesigned because he did not want "an all-gray crew on an all-gray ship." Fletcher redesigned the costumes for Star Trek II: The Wrath of Khan. This design is used in the following movies, up to Star Trek Generations, and variations appear in some flashback scenes of Star Trek: The Next Generation and Star Trek: Voyager. In this costume/uniform, Starfleet officers wear rank insignia on the uniform shoulder strap and left sleeve just above the armband. A service bar is worn just below the sleeve rank pin, denoting how many years of service the officer has devoted to Starfleet in five-year and ten-year increments. The second movie-era uniform consists of a burgundy ("blood") single-breasted jacket with a black stripe along a sealing mechanism (admirals also had smaller gold stripes below, the number depending on rank), with a colored strip, used to close the tunic, over the right shoulder designating division, attached to which is a rank pin. All uniforms include the arrowhead insignia from TOS, now adopted as the Starfleet emblem, on the left chest. Characters also wear a black belt with a buckle shaped like the Starfleet arrowhead. In these films, insignia representing departments are not worn; it is instead indicated by the color of the shoulder strap, arm band, and undershirt. The colors include white, gold, gray, dark green, light green, dark blue, light blue and red. All officer uniforms have a division colored stripe on the outside of the legs on the trousers or skirt that matches the shoulder strap and service bar, except for command branch, whose leg stripes are red, rather than white. Instead of the foot coverings built into the legs of the trousers, the footgear used with this uniform design consisted of black boots whose uppers had heights of eight or ten inches. This costume was nicknamed "The Monster Maroon" uniform because of the difficulty fans often encountered duplicating it. An alternate "bomber" jacket was worn by Kirk and Scott, as well as Admiral Morrow (Star Trek III: The Search for Spock, Star Trek IV: The Voyage Home, Star Trek V: The Final Frontier). In later years Scotty would often remove the jacket all together, simply wearing a black vest, with numerous pockets useful for an engineer, with his undershirt. Scotty's undershirt itself was inconsistent - wearing a white shirt (consistent with his rank of Captain) with the vest or bomber, but a gold one (used by Engineering crew) with his formal duty tunic. Security and engineering personnel wear armor and radiation suits, respectively, similar to those worn in The Motion Picture, although security guards wear a red, turtle-necked uniform underneath (Star Trek VI: The Undiscovered Country). The engineering radiation suits have a colored collar (Star Trek II): black indicates officer, red indicates cadet. There is also a field jacket for away missions with several large pockets, arm patches, white ribbing and a large white turnover collar. Starfleet cadets in The Wrath of Khan wear the same uniforms as officers, but with bright red undershirts and a red shoulder strap instead of one indicating department. Enlisted personnel wear a one-piece red jumpsuit (similar color to the officer uniform) with tan shoulders and upper chest and black undershirts. Enlisted trainees wore the same uniform, substituting a red undershirt for the black one. (Star Trek II). Uniforms similar to this style are shown in the "Next Generation" television series, although without the turtle-neck or belt (TNG: "Yesterday's Enterprise", "Dark Page", "Family, "Violations"). The Starfleet officers and crewmembers seen in The Next Generation wear a jumpsuit with a Starfleet communicator badge (or 'combadge' as it was sometimes called) on the left chest and rank insignia on the right side of the collar. The black areas are seen on the shoulders and the pants, and the uniforms's sleeves and abdominal area are colored to indicate the individual's branch, with red indicating command and helm; gold for engineering, security, and operations; and blue for science and medical (TNG: "Encounter at Farpoint"). The division colors for command and operations switched from those used in Enterprise and TOS. In early episodes, some crew members can be seen wearing a tunic version of the uniform with bare legs and boots. Beverly Crusher often wears a blue laboratory coat over her standard uniform, beginning in TNG: "The Naked Now." The lab coat was primarily developed to hide the pregnancy of Gates McFadden. The blue tended to appear teal under certain lighting conditions in the later seasons and subsequent spinoffs. In some episodes of the later seasons, starting in TNG: "Darmok", Jean-Luc Picard would sometimes wear a different uniform that consisted of a gray shirt with ribbed black shoulders and collar with a "bomber jacket" that was red overall with black ribbed shoulders, often worn open or very loosely fastened. The uniforms could be fitted with pouches for carrying tricorders and Type 2 phasers on the waist, and the early versions had a small pocket built in on the left side of the waist for carrying a smaller Type 1 phaser when appearing openly armed was not desired. The removable gear pouches were also incorporated into the uniforms used in DS9 and the TNG-era films from First Contact onward. We hated our space suits. There were no pockets in them. As much as they call it a stretch fabric, spandex in that configuration doesn't give all that much. It hid nothing. In the show's early seasons, the uniforms were one-piece jumpsuits made of Spandex, and sized slightly too small so that they would be stretched when worn and provide a smooth appearance. But the cast members hated the uniforms's painfully tight fit and lack of pockets, and after Patrick Stewart's chiropractor warned that they risked permanent injury, the actors persuaded the costumers to gradually replace them with wool uniforms. The wool uniforms, which most main cast members wear from the third season onward, are two-piece (shirt and pants) designs that lack colored piping on the shoulders and edges of the pant leg cuffs and have a raised collar. The collar of the shirt has a colored edge of a width similar to that of the original diamond-shaped shoulder piping. The spandex uniforms continued to make appearances throughout TNG, usually worn by extras in various scenes. These were later altered to lack the piping on the shoulders and trouser hems and include a raised collar as a cost-cutting measure. Admirals wore numerous different uniform variations in the early years of TNG - beginning in the sixth season, a final design was settled on, featuring an untucked jacket with gold piping along a centered enclosure on the front, and rank pips (indicating the number of "stars"), encased in a gold square, on both sides of the collar. The TNG dress uniform, which continued to be used in Deep Space Nine and Voyager, is a colored wraparound robe-like coat of a solid division color, save for black shoulders. The edges of the robe-like coats are piped in silver for field officers and in gold for flag officers. Other uniform designs appeared briefly in individual episodes - always following the theme of a colored or differentiated shoulder yoke. Examples include cadet uniforms in several episodes (including "The First Duty"). Wesley Crusher's 'Acting Ensign' gray costume was never specifically identified as a uniform, but it also exhibited a shoulder yoke design. Theiss, the costume designer from the original series, returned to design the initial TNG uniforms; they marked his last contribution to Star Trek wardrobe before he died. The costumes adopted from season 3 onwards and later series' costumes were designed by Robert Blackman. During all the shows set in the 24th century, a consistent insignia scheme is used for officers: a series of gold pips, either a solid color or an outline, worn on each officer's right collar. After the first season of Star Trek: The Next Generation, a consistent scheme is also used for admiral insignia: a series of gold circles inside a black rectangle with a gold border worn on both collars. For the first season of TNG, admirals wear a different insignia, consisting of a triangle or stripe resembling gold weave along the right collar; one or two gold pips are sometimes underneath the weave. Three variants are visible in "Conspiracy": Admiral Quinn's insignia has no pips, Admiral Savar's has one, and Admiral Aaron's has two. A Starfleet insignia is worn on the left breast: this also functions as a communicator badge. 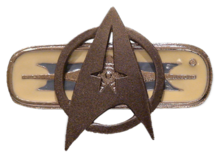 This combadge insignia was redesigned for the movie Star Trek Generations (the only surviving part of a planned redesign of the uniforms), replacing the oval with a trapezoid with a cutout oval in the center. This new combadge is also used in Star Trek: Deep Space Nine from season three onward, and in Star Trek: Voyager. Cadet ranks are rarely ever seen, with the exception of the various visits from Wesley Crusher to the Enterprise in TNG. As it appears in those instances, it can be surmised that the insignia of a Cadet consists of 1, 2, 3, or 4 copper and black bars, similar to those of a modern Lieutenant in the United States Army. It can also be surmised that if a cadet has 1 bar, he has 1 year at the academy. 2 for 2 years, and so on. Enlisted ranks are seen even less; their insignia are unclear. Deep Space Nine introduced a new style of uniform that appeared to run in parallel to the one seen on TNG. The new uniform comprised a single two-piece open-necked jumpsuit with the colored and black areas of the TNG uniform reversed (black torso and colored shoulders) and the science division is now blue-green with the upper part being a removable jacket along with a visible zipper. The division colors use the same TNG scheme. A grayish-indigo mock turtleneck undershirt was added, to which rank pips are affixed. The characters of Major Kira and Odo did not wear Starfleet uniforms, as they were part of the Bajoran forces. Throughout the run of DS9, ship-based Starfleet personnel continue to wear the older uniform design. Sisko also wore the TNG uniform on certain formal occasions, during his first arrival at DS9 (in the series pilot episode, "Emissary"), and when he was temporarily given the duties of "Head of Security" for Starfleet Headquarters on Earth (in the Season 4 episode, "Paradise Lost"). Admirals also retained the TNG style. A uniform similar to that appearing in the DS9 series can be seen in the TNG Season 3 episode "Allegiance", worn by the alien masquerading as a Starfleet cadet. The DS9 uniforms were first used in the premiere episode, "Emissary" and would continued to be used up to the Season 5 episode, "The Ascent". Following the release of Star Trek: First Contact, the new gray movie uniform design also appeared in DS9's fifth season and for the remainder of the series. However, the old DS9 uniform appears four more times following the introduction of the movie gray uniform design in the Season 5 episodes, "In Purgatory's Shadow" and "By Inferno's Light" worn by the real Dr. Julian Bashir while still being trapped in the Internment Camp 371 as well as the Season 7 episode, "Field of Fire" in a photograph and in the flashback scenes of the series finale, "What You Leave Behind". New uniforms were designed and made for the movie Star Trek Generations, but were abandoned at the last minute. These included a fastening on the right side of the chest and a slightly more militaristic approach with rank bandings on the sleeves and a colored collar. The costumes for the female crew-members were different - instead of the additional fastening, there was a higher than previously seen black band around the waist. Nonetheless, Playmates Toys released a number of action figures wearing these planned uniforms. Generations instead has the crew wearing both TNG and DS9/VOY uniforms, sometimes in the same scene (for instance, Worf and Riker in the battle against the Duras Sisters' Bird of Prey or Data and Geordi scanning the Amargosa Observatory for trilithium) as Jonathan Frakes and LeVar Burton had to borrow Avery Brooks and Colm Meaney's costumes respectively since the time was so short while there was enough time to make DS9/VOY-style costumes to fit on Patrick Stewart and Brent Spiner. As the movie progresses, some characters can alternate between the TNG and DS9/VOY uniforms and sometimes switch back to the old TNG uniforms (for instance, Picard switched back to the TNG uniform in the film's last scene). This would act as an introduction of the new design as standard shipboard wear for Star Trek: Voyager. The new style combadge (with the previous gold oval background replaced by a rectangular gold background with a cutout in the center) was also introduced for all uniform types. This combadge was subsequently adopted for DS9 (at the beginning of its third season) and Star Trek: Voyager. 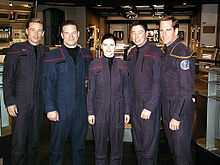 The crew in Star Trek: Voyager use the same uniforms seen in the early episodes of Deep Space Nine throughout the show's run. Stuck in the Delta Quadrant and out of contact with Starfleet, unlike the TNG crew and the DS9 crew, the Voyager crew never makes the switch to the updated uniform seen in later DS9 episodes and in the last three TNG films as they continued to use the old DS9 uniforms for the remainder of the series, although in the episode "Message in a Bottle" in season 4 of the series the EMH mark II is wearing the updated "DS9"/movie gray TNG uniform. Starfleet personnel back in the Alpha Quadrant are seen wearing this uniform in later seasons of the show as well, when Voyager manages to reestablish contact with home. The crew also wears the TNG-style dress uniforms (VOY: "Course: Oblivion", "Someone to Watch Over Me", "One Small Step", "Ashes to Ashes"). B'Elanna Torres is sometimes seen wearing an overcoat over her normal uniform which matches the colors of her normal uniform, but has a pocket on the right breast for carrying small tools. The jacket was used in an attempt to hide actress Roxann Dawson's pregnancy. She wore it again when her character became pregnant, beginning in the episode "Q2". The crew aboard the USS Equinox also use the same uniforms seen in the early episodes of Deep Space Nine as they are also stuck in the Delta Quadrant and out of contact with Starfleet (VOY: "Equinox (Parts I and II)"). The 29th-century officers in the Star Trek: Voyager episode "Relativity" wear chevron-like collar insignia (worn in a horizontal line like the pips and oriented pointing forwards towards the collar). Captain Braxton wears 4 gold chevrons (equivalent to 4 gold pips) and Lieutenant Ducane wears 2 gold chevrons (equivalent to 2 gold pips). The new Starfleet insignia is a silver diamond shape inset with a gold "Arrowhead" symbol facing to the left; this is probably a combination communicator and temporal beacon. The tunics have a quilted fabric in branch color on the right shoulder and sleeve (Blue for Command, Olive Drab Brown for Operations, and Gray for Sciences) and branch-color piping on the edge of the shoulder yoke. In "Living Witness", the crew was shown to be wearing black undershirts with a high collar (turtleneck style) instead of the usual grayish-indigo undershirts with a low collar, no combadges or rank insignia, while some were wearing black gloves including Captain Kathryn Janeway. This was in the context of historical records that wrongly asserted that Voyager’s crew had acted in a malign manner, until corrected by The Doctor, who was brought back to life 700 years in the future after a “relic” (containing a backup copy of his program) was discovered among wreckage and his program was recovered. Star Trek: First Contact introduces a new uniform style later adopted in DS9 (DS9: "Rapture"). This uniform features a colored turtleneck undertunic (with the same departmental color scheme as in earlier shows) covered by a black jacket with colored bands on the lower sleeves near the cuffs showing the wearer's division, the shoulders and upper chest of which are ribbed and made of thick, violet-gray material. Like the last two uniforms, the communicator badge is worn on the jacket, while rank pins are worn on the undertunic's collar. The pants are black. Star Trek: Insurrection also introduced a new dress uniform, consisting of a white jacket and black pants both with gold trim, a gray ribbed tunic (white tunic for flag officers and captains), and rank insignia on the collar of the tunic with the combadge worn in the customary location on the jacket. Unlike the previous uniform, it was the same color regardless of the wearer's division, save for colored bands on the lower sleeves like the standard uniform. It also appeared in the DS9 episode "Inter Arma Enim Silent Leges". Captains also had the option of a more casual uniform vest of the same basic design, though the violet-gray extended much lower. Starfleet personnel fighting in ground battles appear in the DS9 episodes "...Nor the Battle to the Strong" and "The Siege of AR-558". They wear one-piece black uniforms with divisional stripes across the chest. In the TNG episode "All Good Things...", an alternate timeline showed a uniform with the full color shirt (including shoulders). The same colors were used and the rank insignia would be shown above the right breast over a black line which cut off the shoulder area. These uniforms would also make an appearance in the Star Trek: Deep Space Nine episode "The Visitor" and the Star Trek: Voyager episode "Endgame". These episodes also included a new combadge design where the starfleet arrow was just an outline. This badge was also worn by Geordi La Forge in the Star Trek: Voyager episode "Timeless" but on the gray shoulder uniform used in the last three TNG movies and the later episodes of Deep Space Nine. The Star Trek: The Next Generation episode "Parallels" used an alternate combadge design where rank was denoted by the number of bars behind the arrowhead. Variations in uniforms and insignia are occasionally used as plot devices in the various series. In the episode "Future Imperfect", the insignia are slightly altered so as to convince a character that 16 years have passed. In the episode, "Parallels", variations in uniforms and insignia suggest a meeting of characters from different parallel universes. In Enterprise, field officers and crewmembers wear duty uniforms consisting of a dark long-sleeved undershirt and blue jumpsuit with colored piping around the shoulders and, occasionally, baseball caps. There is also a desert uniform with khaki pants and white shirt. Both uniforms have a United Earth Starfleet patch (featuring the stylized arrowhead emblem) on the right upper arm, and a patch left upper arm denoting the ship one is serving on. Enterprise, set before all other incarnations, did not include characters who hold the ranks of lieutenant commander or lieutenant, junior grade. The highest-ranking admiral seen wears two sets of three-pip insignia. Division colors follow the original TOS scheme, with command and flight control officers wearing gold piping, engineering, communications, and security officers wearing red piping, and medical and science officers (including linguists) wearing blue piping. Throughout the series, men and women wear the same type of uniform. Unlike the other series' uniforms, standard uniforms on Enterprise include zip-up pockets, and the undershirt is buttoned at the neck - while Gene Roddenberry had explicitly forbidden such devices as buttons and zippers on Starfleet uniforms, believing they would be obsolete in the future, designer Bob Blackman consciously used them as a way of dating the series, implying that closures Roddenberry envisioned had not been invented yet. Blackman described the jumpsuits as "more like a NASA flight suit" than the previous Starfleet costumes, and actors from other Star Trek shows envied the Enterprise actors' much more comfortable and conventional outfits. On certain occasions, Enterprise characters wear dress uniforms similar to the blue jumpsuit, decorated with the same pattern of colored piping, but lacking the zip-up pockets and combined with a white long-sleeved undershirt and, sometimes depending on rank, a white tie. Rank insignia on duty uniforms are worn on right side of shoulders only, but rank insignia on dress uniforms are worn on both sides. Also, there are two different kinds of field jackets worn on away missions. They have zippered pockets and the same colored pipings as the jumpsuits, as well as cold weather gear, pressure suits, spacesuits, an EV undersuit, and a royal blue undergarment with slight differences on male and female garments. During the series, T'Pol is almost never seen wearing the standard uniform although she is a commissioned officer in Starfleet, and often considered to be the first officer. The only times she wears the uniform is in the episode "Twilight" (featuring an alternate timeline) and briefly (as a disguise) in "Hatchery". In 2017's Star Trek: Discovery, set ten years prior to Star Trek: The Original Series, the uniform underwent another redesign. Like its Enterprise predecessor, a blue uniform was worn, with a shirt-trouser combination with a single collar on the left side. A large zipper fastens the front of the shirt, and pants pockets have zippers as well. Repeating patterns of tiny delta insignias ran down the sides of the uniforms, its colors denoting the wearer's division. The classic yellow, blue, red combination was eschewed in favor of gold, silver and copper for command, sciences and operations respectively. Ranks were embedded onto the Starfleet Delta, along with gold shoulder stripes for captains and shoulder stripes plus gold shoulder markings for admirals, and following the same standard as Star Trek: The Next Generation style rank insignias. J.J. Abrams' Star Trek series takes place in a parallel universe called the "Kelvin timeline". The 2009 Star Trek film features uniforms reminiscent of the original television series but with some cosmetic changes. The badge (already the logo of the full Starfleet instead of specific to the Enterprise) is now a pin rather than sewn on and comes in silver-metal for officers and gold-metal for admirals. The tops are now in two layers: a wide-collared colored over-shirt (gold, blue, or red just as in the original series) with a quilted pattern and a colored hem-line from the neck to the armpit, and a black undershirt, visually imitating the black collar of the original TOS design. The over-shirt has the division delta badge shape printed onto the fabric providing a textured appearance. Rank is indicated by 1 to 4 silver metallic-cloth bands worn above the overshirt's cuffs (1 for lieutenants, 2 for commanders, 3 for captains, and 4 for flag officers). As in the original series, female officers wear dresses, some with short sleeves (seen on Lt. Uhura), others with long sleeves (as seen on some of the background extras). Also, a number of women onboard can be seen wearing the long sleeve top and pants uniform similar to those worn in "The Cage". Unlike other Trek, this uniform is worn only aboard starships - other personnel wear black one-piece uniforms of a much more "military" appearance. In an unexplained change from previous series, many female crew members wear nail polish (Uhura wears black polish, while many extras wear red). Dress uniforms for academy cadets and staff are crimson, while flag officers (fleet captains and admirals) use a gray uniform with a white false-plastron front. The design is similar to that in The Motion Picture, stated by designer Michael Kaplan in the book Star Trek: The Art of the Film to be a deliberate homage. Rank is indicated by 1 to 5 paired diamond-shaped silver-metal "pips" worn on the tunic's shoulder-boards (ensigns wear 1 paired pip, lieutenants wear 2 paired pips, commanders wear 3 paired pips, captains wear 4 paired pips, and flag officers wear 5 paired pips). The uniforms in the second J. J. Abrams Star Trek film are developed further. The formal uniform for Starfleet officers on the ground is shown to be a mid-gray in color and a similar style to the red uniforms worn by the academy cadets in the first film. A more informal uniform jumpsuit is worn at various points by several characters (including Kirk and Scotty). These jumpsuits have high collars and are made of a dark gray fabric, with triangles of transparent plastic at the collarbones which show the color of the officer's regular uniform shirt beneath. The personnel on the USS Vengeance wear a different duty uniform from the norm. It consists of black trousers and undershirt, with a quilted blue overshirt with long black sleeves and black cloth epaulets. This might either be the uniform of a private armed security or military contractor company hired by Marcus through Section 31 or the duty uniform for Section 31 itself (the blue indicating its Research & Development wing). Admiral Marcus' rank on this uniform is indicated by a wide silver band over a narrow silver band and under two narrow silver bands on the cuff; this might be[weasel words] the duty uniform insignia for a Commodore. Rank for admirals (as worn by Admiral Alexander Marcus) is indicated by 1 to 5 paired diamond-shaped gold-metal "pips" worn on the flag officer tunic's shoulder-boards. Marcus is described as a fleet Admiral (usually equivalent to a NATO five-star military rank) and wears 5 paired gold pips on his shoulder-boards. There are other ranks mentioned in the movies (Kirk himself is offered the rank of Vice-Admiral in Star Trek: Beyond). If the rank scheme is similar to NATO ranks they would be: Commodores wear 1 paired gold pip, Rear Admirals wear 2 paired gold pips, Vice-Admirals wear 3 paired gold pips, and Admirals wear 4 paired gold pips. Alternatively, the rank of fleet captain (a senior grade of captain and brevet flag officer rank) is signified by 5 paired silver pips, and the rank of admiral is always signified by 5 paired gold pips regardless of grade. Some licensed Star Trek publications present some insignia that contradict the ones shown on screen or in other publications. For example, the second and third editions of The Star Trek Encyclopedia offer differing insignia for various Starfleet ranks. Additionally, some Star Trek publications, including officially licensed ones, posit additional ranks that are not seen or mentioned in live-action productions. ^ "The Cage" and "Where No Man Has Gone Before"
^ "2245-2265 Divisions". St-spike.org. Retrieved March 10, 2015. ^ a b c d Okuda, Michael; Okuda, Denise (1999). The Star Trek Encyclopedia: A Reference Guide to the Future (Updated and expanded ed.). New York: Pocket Books. ISBN 0-671-03475-8. ^ Gurian, Gerald (March 8, 2009). "Star Trek Exhibition In Detroit - Original Series Captain Kirk Uniform". Startrekpropauthority.blogspot.com. Retrieved January 23, 2013. ^ "Nichelle Nichols - Communications expert Uhuru from Star Trek's Original series". BBC. Retrieved May 7, 2011. ^ Gurian, Gerald (May 4, 2008). "Bill Theiss Lost Interview". Startrekpropauthority.blogspot.com. Retrieved January 23, 2013. ^ Gurian, Gerald (May 17, 2008). "Special Photostudy Star Trek TOS Command Tunic". Startrekpropauthority.blogspot.com. Retrieved January 23, 2013. ^ Reeves-Stevens, Judith; Reeves-Stevens, Garfield (1997). Star Trek, Phase II: The Lost Series. New York: Pocket Books. ISBN 9780671568399. ^ Sackett, Susan (1980). The Making of Star Trek. New York: Pocket Books. ISBN 978-0-671-79109-4. ^ a b "Star Trek: TNG: An Oral History". Entertainment Weekly. September 25, 2007. Retrieved May 7, 2011. ^ a b "BBC Two - Star Trek". Bbc.co.uk. August 25, 2007. Retrieved March 10, 2015. ^ "New Movie Costumes Planned". Star Trek Monthly. Titan Magazines. June 1996. p. 7. ^ Jose, Maria; Tenuto, John (December 23, 2013). "Collecting Trek: Toys, Cards & More Depicting Deleted Scenes". Star Trek.com. Retrieved December 25, 2013. ^ Star Trek Voyager - The Complete Fourth Season (DVD). Paramount. September 28, 2004. ^ a b Braga, Brannon; Menosky, Joe; Berman, Rick (April 28, 1998). "Living Witness". Star Trek: Voyager. Season 4. Episode 23. UPN. ^ "Star Trek Timeless". Startrek.com. November 18, 1998. Retrieved January 23, 2013. ^ "Bob Blackman on uniforms in Enterprise". BBC. Retrieved December 31, 2006. ^ "Garret Wang - Voyager's ever-dependable Ensign Harry Kim". BBC. Retrieved May 7, 2011. ^ "Jonathan Frakes - The Next Generation's Number One, Will Riker, and Trek director". BBC. Retrieved May 7, 2011. ^ Harvey, Aaron (June 22, 2017). "A Close-Up Look At 'Star Trek: Discovery' Uniforms [INFOGRAPHIC]". TrekMovie.com. Retrieved August 28, 2017. ^ Michael Okuda; Denise Okuda; Debbie Mirek (May 17, 2011). The Star Trek Encyclopedia. Pocket Books/Star Trek. ISBN 978-1-4516-4688-7. Retrieved May 6, 2013. Images accessible at "Rank Comparison". Spike's Star Trek Page Rank Chart. Retrieved December 26, 2006.